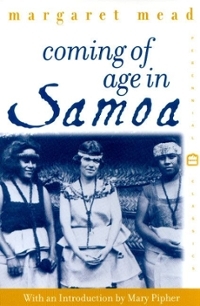 Coming of Age in Samoa 0 Edition Rarely do science and literature come together in the same book. When they do -- as in Charles Darwin's On the Origin of Species, for example -- they become classics, quoted and studied by scholars and the general public alike.Margaret Mead accomplished this remarkable feat not once but several times, beginning with Coming of Age in Samoa. It details her historic journey to American Samoa, taken where she was just twenty-three, where she did her first fieldwork. Here, for the first time, she presented to the public the idea that the individual experience of developmental stages could be shaped by cultural demands and expectations. Adolescence, she wrote, might be more or less stormy, and sexual development more or less problematic in different cultures. The "civilized" world, she taught us had much to learn from the "primitive." Now this groundbreaking, beautifully written work as been reissued for the centennial of her birth, featuring introductions by Mary Pipher and by Mead's daughter, Mary Catherine Bateson.